You'll be £6.00 closer to your next £10.00 credit when you purchase Malayan Emergency. What's this? By the time of the 1942 Japanese occupation of the Malay Peninsula and Singapore, the Malayan Communist Party (MCP) had already been fomenting merdeka – independence – from Britain. The Japanese conquerors, however, were also the loathsome enemies of the MCP’s ideological brothers in China. An alliance of convenience with the British was the outcome. Britain armed and trained the MCP’s military wing, the Malayan People’s Anti-Japanese Army (MPAJA), to essentially wage jungle guerrilla warfare against Japanese occupying forces. With the cessation of hostilities, anti-Japanese became anti-British, and, using the same weapons and training fortuitously provided by the British army during the war, the MCP launched a guerrilla war of insurgency. Malaya was of significant strategic and economic importance to Britain. In the face of an emerging communist regime in China, a British presence in Southeast Asia was imperative. Equally, rubber and tin, largely produced in Malaya by British expatriates, were important inputs for British industry. Typically, the insurgents, dubbed Communist Terrorists, or simply CTs, went about attacking soft targets in remote areas: the rubber plantations and tin mines. In conjunction with this, was the implementation of Mao’s dictate of subverting the rural, largely peasant, population to the cause. Twelve years of counter-insurgency operations ensued, as a wide range of British forces were joined in the conflict by ground, air and sea units from Australia, New Zealand, Southern and Northern Rhodesia, Fiji and Nyasaland. A Timeline for the period from 1946 to 1960 precedes the Introduction – a brief history from 1800 includes the development under Raffles, the collapse of rubber and tin prior to the Second World War needs, and the emergence of the Chinese used to defeat Japanese becoming Communist Terrorists. In April 48 the British conducted an ‘anti-bandit’ operation against the pseudo Communist Terrorist government and their accompanying tax extortion. By June 48 the ‘Emergency’ was declared (as potential insurance claims for losses would be voided in a war situation). Causes, processes and outcomes are based on first hand accounts, newspaper articles and thorough research. Most of the narrative is based on Rhodesian Army accounts, with scant mention of the other colonial forces involved. The South African and British forces are listed and enemy strategy and tactics are examined in detail. A coloured insert includes photos, maps, equipment and RAF aircraft. A good Bibliography rounds out a most readable coverage of the subject. A curious and interesting book for those lovers of history who like stories based on real events. 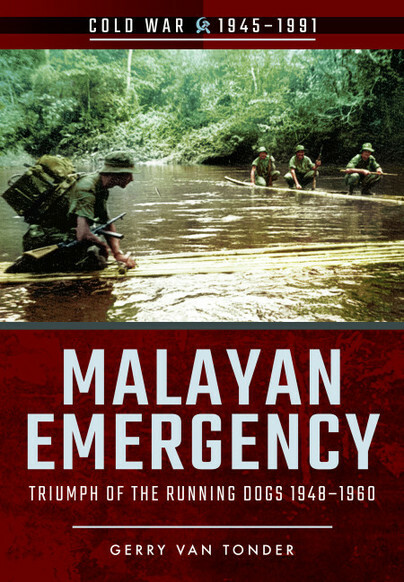 This addition to the Cold War series provides a very capable overview of the Malayan Emergency. The Cold War series is developing nicely and building its readership. This new book in the series follows the now established format with many photographs and commissioned sketches and drawings – Highly Recommended. Gerry van Tonder was born in Zimbabwe and came to Britain in 1999. He is a full-time historian and a published author. Specializing in military history, Gerry has authored Rhodesian Combined Forces Roll of Honour, 1966–1981; Book of Remembrance: Rhodesia Native Regiment and Rhodesian African Rifles; North of the Red Line (South African Defence Force’s border war), and the co-authored definitive Rhodesia Regiment, 1899–1981, a copy of which he presented to the regiment’s former colonel-in-chief, Her Majesty the Queen. Gerry has also written on British local history, including Derby in 50 Buildings, Chesterfield’s Military Heritage and Mansfield Through Time. He recently started with a series of Cold War titles and Echoes of the Coventry Blitz.